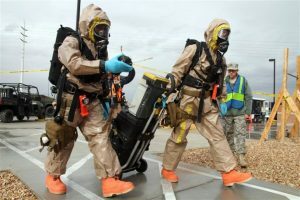 “Chemical Biological Radiological Nuclear and Explosives (CBRNE) Detection Equipment Market: Global Industry Trends, Market Size, Competitive Analysis and Forecast – 2018 – 2026”, this study is recently published by Research Corridor covering global market size for Chemical Biological Radiological Nuclear and Explosives (CBRNE) Detection Equipment market for the key segments and further cross-regional segmentation of these segments for the period 2018 to 2026. According to Research Corridor this study will provide in-depth analysis of segments on the basis of current trends, market dynamics and country level analysis of Chemical Biological Radiological Nuclear and Explosives (CBRNE) Detection Equipment industry. This report provides market estimates and forecast for the period 2016-2026, along with respective CAGRs for each segment and regional distribution for the period 2018-2026. In depth analysis of competitive landscape, porter’s five forces model, value chain analysis, and pricing strategies are also covered in the report scope.